Tent cards are used to promote a product in a retail setting or to reserve a space for VIP's at an event. 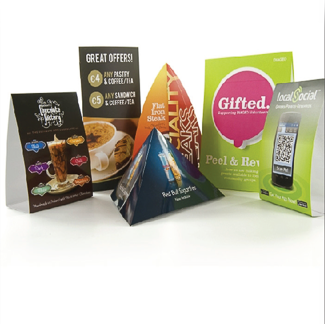 Tent cards can be used in restaurants for drink or food promotions. They can also be used at point of purchase locations to offer specials to your customers as they check out. QPS prints tent cards in many sizes, shapes and colors. If you're promoting a product with your tent cards you might select an upright, over sized tent card that will catch your customer's eye. At a corporate event you might want a low key, small, horizontal name tent card to reserve a place for executives at a table. Maybe you even need tent cards to serve as directional signs at events. Whatever your tent card needs are, QPS can help you with it.